Sovereign Silver First Aid Gel is the ONLY Homeopathic topical preparation to harness the revolutionary power of silver in the form of Argentum Metallicum 10x, 20x, 30x, (Homeopathic Silver). 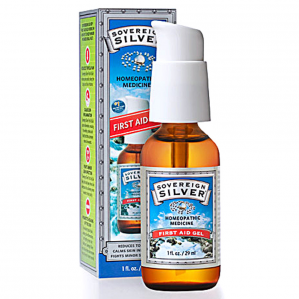 Reduces Topical Pain: Sovereign Silver First Aid Gel reduces pain quickly, taking the sting out of skin irritations. Calms Skin Inflammation: Sovereign Silver First Aid Gel calms inflammation, reducing the swelling, redness and heat that often accompany minor skin wounds. Fights Minor Skin Infection & Promotes Healing of the Skin: Sovereign Silver First Aid Gel helps the body to keep minor skin infection at bay, allowing minor wounds to heal quickly. Kid-Friendly: Sting-free formula reduces topical pain, does not add to it. Safety: Homeopathy has no known side effects. Clean & Pure: No synthetic preservatives. Non-Greasy, Transparent & Odorless: You'll hardly know it's there. FOR BEST RESULTS: Apply a liberal layer of the gel in order to allow for consistent, sustained delivery. Leave wet. Do Not rub until dry. After absorption, repeat as often as needed to prolong its activity. Minor Burns:Clean affected area with water, pat dry, then apply a layer of First Aid Gel, leave wet and cover. Repeat as needed to relieve symptoms. For serious burns, seek appropriate medical attention. Razor Burn: Spread thin layer over affected area after shaving. Bug Bites & Stings: Place a dab of First Aid Gel over affected area. Repeat as needed to relieve symptoms. If swelling or pain persists or worsens due to allergic reaction to bug bite or sting, seek medical attention. Itching: Spread thin layer over affected area as needed to relieve symptoms. Minor wounds: Clean affected area then apply a generous layer of First Aid Gel, leave wet and cover. Bruises: Apply a layer of First Aid Gel over bruised area. Repeat three times daily until bruise dissipates. Ulcerations: Apply generous layer, cover. Repeat three times or more per day until symptoms are relieved. Blisters: Cover blister with a layer of First Aid Gel. Repeat three times daily until symptoms abate. Acne: Clean affected area, then apply a thin layer of First Aid Gel, morning and night. Diaper Rash: Clean affected area and apply layer of gel after each diaper change until symptoms abate. Eruptions from eczema, Acne or Shingles: Apply a layer of First Aid Gel as needed to relieve symptoms. Minor Infection: Clean affected area and apply a layer of First Aid Gel then cover. Repeat three to five times during the day until symptoms abate. If symptoms persist or worsen after three days, seek appropriate medical attention.